The Lightning should be doing everything they can in a few months at the beginning of March to make a few more upgrades for a deep playoff run. Finding someone to play with Stamkos and acquiring another defenseman should be the top priorities. What players are out there right now? One player that I see being a perfect fit in Tampa Bay and with Steven Stamkos is yet another New York Ranger. I am talking about 5’7 Norwegian Mats Zuccarello of the New York Rangers. Zuccarello made his NHL debut in 2010 after signing with the Rangers following the 2010 Vancouver Winter Games. He is a small, fast forward, with a very good skill set and elite vision and passing ability. Plays like this is what got him noticed by several NHL clubs. At the time he was the leading scorer in the Swedish Elite League. 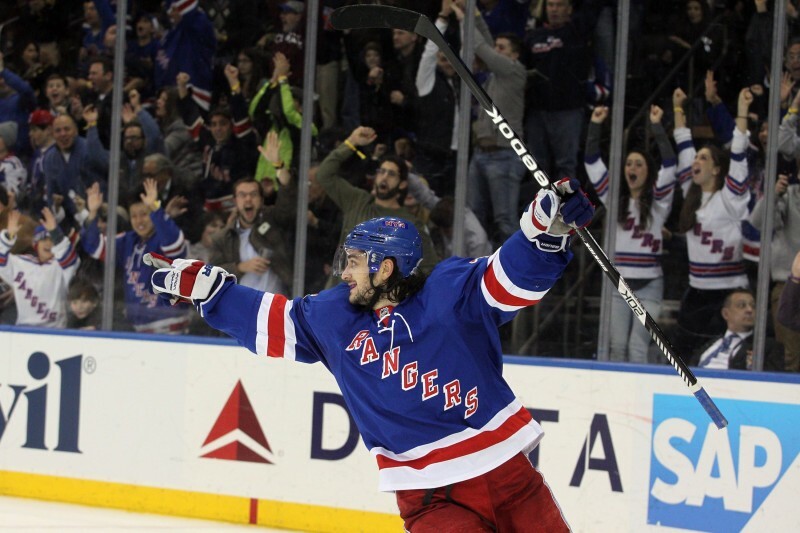 Zuccarello is a gritty player for his size and will always battle for pucks in the corner and along the wall. Each year, despite constant improvements to his game, the Rangers always follow with a 1-year-deal. Zuccarello had his best season last year when he led the Rangers in points with 19 goals, 40 assists, 59 points, and a +11 rating. He was rewarded with another 1-year-contract for $3.5 million per season. Why would the Rangers trade a player that currently plays on their top line? Well, the New York Rangers are right near the salary cap ceiling. The club has just over $1 million in cap space available right now. They have a lot of players to resign this offseason that include top center and restricted free agent Derek Stepan, unrestricted free agent Martin St. Louis, unrestricted free agent defenseman Marc Staal, and restricted free agents Carl Hagelin, Jesper Fast, JT Miller, and John Moore. All players are going to want bigger contracts and the biggest contract will be the one of Derek Stepan. Stepan who currently makes $3 million per season should be expecting at minimum double the salary he is making now if not more. Stepan is arguably the most valuable forward on the Rangers. Stepan has developed into a very good two-way center that plays in all situations for the Rangers. Depending on how high the cap increases for the 2015-2016 season will determine GM Glen Sather’s options. Someone is going to have to be moved and despite all his successes, I have a feeling the Rangers will look to at least shop Zuccarello this upcoming March. If a career season only earned him another 1-year-deal, the two sides might have some differences next summer as Zuccarello has not put up the points like he did last year. Who Would the Lightning Trade? Zuccarello’s playmaking ability and passing would make him an excellent fit on Steven Stamkos’s wing. Zuccarello would use his vision and creativity on the ice to get the puck to Stamkos on a regular basis. Below is some of Zuccarello’s best moments in the NHL where you can see his very high skill level. In addition Mats Zuccarello is as consistent in the shootout as any player in the league. What would be a fair return for a player of Zuccarello’s caliber? The Rangers are always looking for centers. Why not ask for one of the Lightning’s young centers? The Bolts have a plethora of centers and moving one for Zuccarello would make sense. A fair deal would be Mats Zuccarello for Cedric Paquette or Vladislav Namestnikov and a 2nd round pick in the 2015 draft. This is how the Lightning offense would look for the playoffs with Zuccarello.